​Genetics is the study of how hereditary characters are transferred from one individual to another. Let’s review some basic concepts which are fundamental for a better understanding of the unit. Nucleic acids are macromolecules composed of monomers called nucleotides. (Composed of C, H, O, N and P) There are two types of nucleic acids: ribonucleic acid (RNA) and deoxyribonucleic acid (DNA). All living organisms contain both types of nucleic acids. ​All living things require a blueprint, a recipe book, to make various essential molecules in our body namely proteins. Like most other organisms, the blueprint for humans is found in the form of DNA which we inherit from our parents. DNA contains four molecules known as bases: adenine, thymine, guanine and cytosine (A, T, G and C respectively). Sequences of these bases make a code which can be read by cells to create a variety of proteins which then control every aspect of the life processes. DNA is made up of molecules called nucleotides. Each nucleotide contains a phosphate group, a sugar group and a nitrogen base. 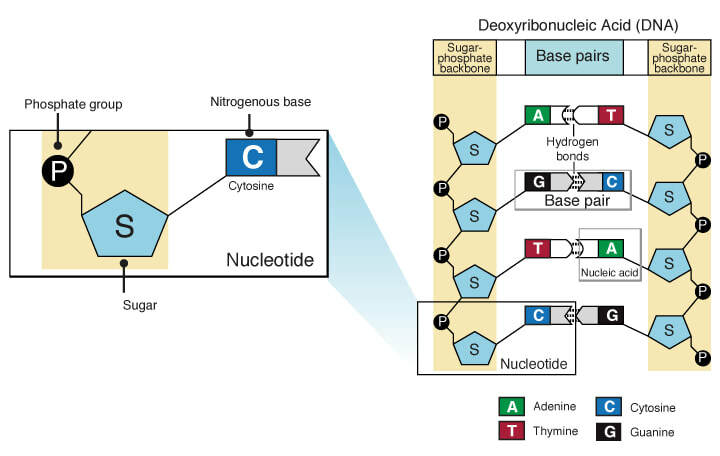 The four types of nitrogen bases are adenine (A), thymine (T), guanine (G) and cytosine (C). The order of these bases is what determines DNA's instructions, or genetic code. Human DNA has around 3 billion bases, and more than 99 percent of those bases are the same in all humans. Similar to the way the order of letters in the alphabet can be used to form a word, the order of nitrogen bases in a DNA sequence forms genes, which in the language of the cell, tells cells how to make proteins. Another type of nucleic acid, ribonucleic acid, or RNA, translates genetic information from DNA into proteins. Nucleotides are attached together to form two long strands that spiral to create a structure called a double helix. 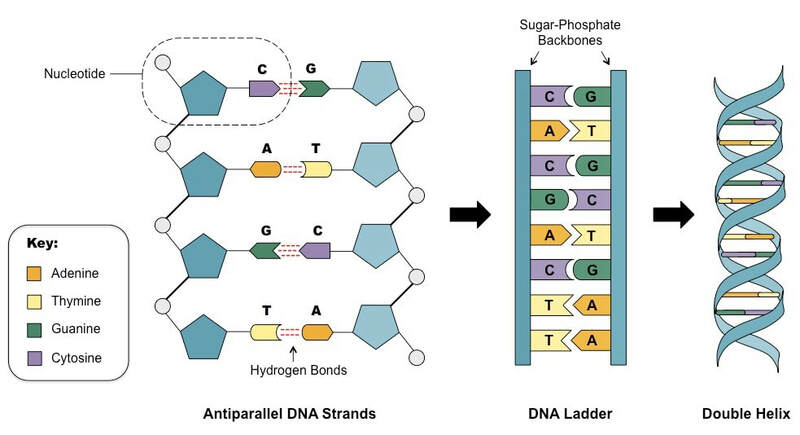 If you think of the double helix structure as a ladder, the phosphate and sugar molecules would be the sides, while the bases would be the rungs. The bases on one strand pair with the bases on another strand: adenine pairs with thymine, and guanine pairs with cytosine. DNA molecules are long — so long, in fact, that they can't fit into cells without the right packaging. 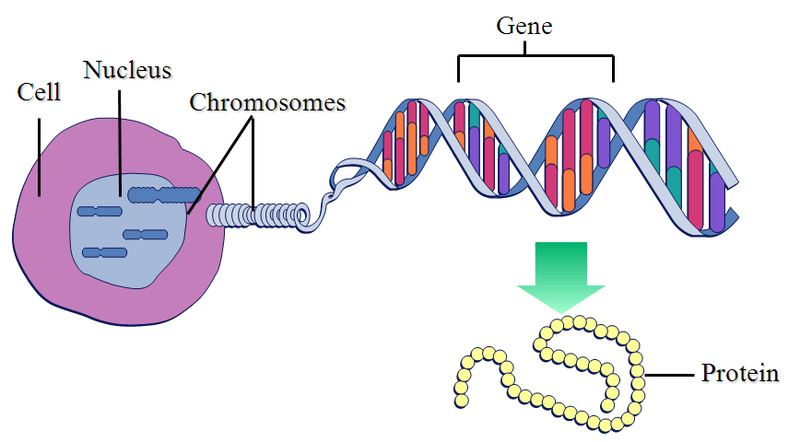 To fit inside cells, DNA is coiled tightly to form structures we call chromosomes. Each chromosome contains a single DNA molecule. Humans have 23 pairs of chromosomes, which are found inside the cell's nucleus. The central dogma of biology is an explanation of the flow of genetic information within a biological system. It is often stated as "DNA makes RNA and RNA makes protein,". It was first stated by Francis Crick in 1957. From RNA to make new proteins (translation). The central dogma says that DNA contains the information needed to make all of our proteins, and that RNA is a messenger that carries this information to the ribosomes. In transcription, the information in the DNA of a cell is converted into small, portable RNA messages. During translation, these messages travel from where the DNA is in the cell nucleus to the ribosomes where they are ‘read’ to make specific proteins. The ribosomes serve as factories in the cell where the information is ‘translated’ from a code into the functional protein. 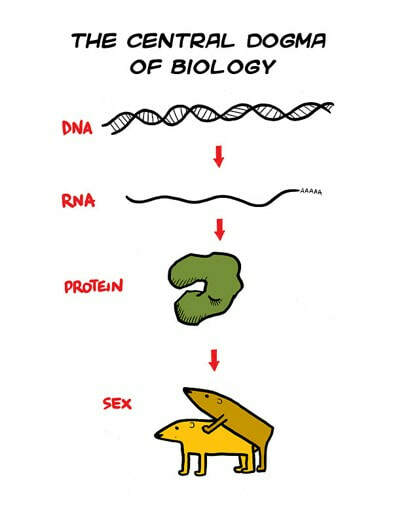 Proteins determine the traits of living things and these traits, coded in the DNA, can then be passed on when the organism reproduces..
From the point of view of DNA, organisms can be seen as "gene machines" in other words all the processes living things do (interaction, nutrition, reproduction) are for spreading and replicating the genes in their DNA. 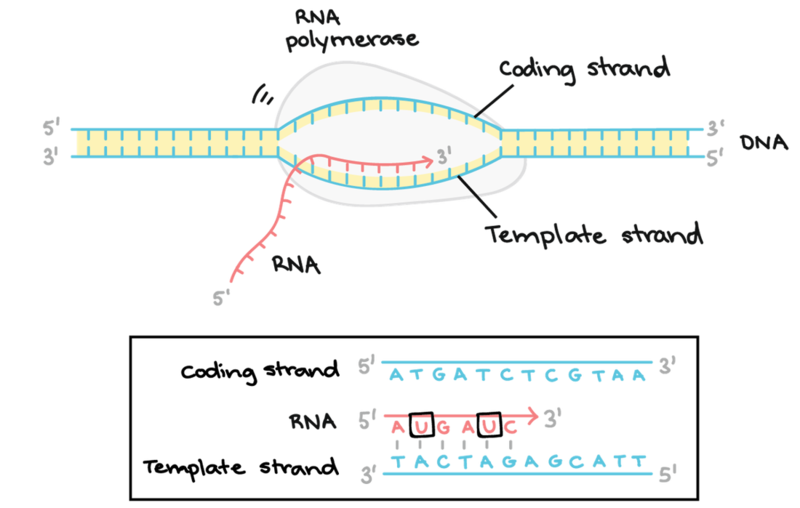 During transcription, a DNA sequence is read by an RNA polymerase, which produces a complementary, antiparallel RNA strand called a primary transcript. It would be dangerous to cut up the DNA to send instructions. so copies of a particular sequence are made with RNA which can travel outside the nucleus.. In RNA the T nucelotide is replaced with a U.
RNA polymerase, binds to DNA. RNA polymerase separates the two strands of the DNA helix. This is done by breaking the hydrogen bonds between complementary DNA nucleotides. A sugar-phosphate backbone forms to produce an mRNA strand. The then completed mRNA exits to the cytoplasm through the nuclear pores. Translation is the formation of proteins by ribosome, who "translate" the mRNA code into a chain of amino acids. Once in the cytoplasm the mRNA joins with the organelles known as ribosomes, which will translate the information into a protein. There will be a different protein for each gene and each protein will be responsible for a particular character of the individual e.g. green colored eyes. Translation of an mRNA molecule by the ribosome occurs in three stages: initiation, elongation, and termination. During initiation, the small ribosomal subunit binds to the start of the mRNA sequence. to what is called the start codon.. The start codon in all mRNA molecules has the sequence AUG and codes for methionine. Next, during the elongation stage, the ribosome translates each codon in turn. Each corresponding amino acid is added to the growing chain and linked via a bond called a peptide bond. Elongation continues until all of the codons are read. Lastly, termination occurs when the ribosome reaches a stop codon (UAA, UAG, and UGA). which signals that translation is complete. The chain of amino acids is then released and will begin to fold itself into a specific shape, based on the order of amino acids, to create a finished protein. A gene is a section of DNA that codes for a specific protein. It is the basic unit of hereditary. Genes hold the information needed to build and maintain an organisms cells. This determines the traits of the organism. These genetic traits can then be passed on to offspring. A genetic mutation is a permanent change in the DNA code.. If it occurs in somatic (normal body) cells then it is not passed on. If a mutation occurs in the DNA of a gamete (egg or sperm) it may be passed on to offspring.. Fot the most part, genetic differences between organisms come from some kind of mutation. Every unique gene began as a mutation of an existing gene. Mutations occur naturally as accidental changes to DNA or chromosomes during the cell cycle. There are enzymes that repair and check DNA during replication but these enzymes are not always 100% effective so changed or damaged DNA can be replicated. The rate of mutation can be increased by some environmental factors. These factors are called mutagens and include things like UV light, radiation, X rays and some chemicals.. The effect of mutations depends on where and when the mutation occurs. Because of the way DNA is translated, a change in the DNA code may affect just one amino acid in a protein or cause the entire protein to be translated incorrectly.. Most mutations have no visible effect on the organism. For mutations where there is an effect the result is usually bad. An incorrect protein works less effectively or doesn't work at all and this decreases the fitness of the organism. In very rare cases a mutation might result in a protein that works better or does something new that provides an advantage to the organism. This is what allows species to evolve and adapt to new conditions over time. There are many different ways that DNA can be changed, resulting in different types of mutation. Here is a quick summary of a few of these:. 1. Substitution: a mutation that exchanges one base for another. Also known as a missense mutation. 2. Insertion: a mutation in which extra base pairs are inserted into a new place in the DNA. 3. Deletion: a mutation in which a section of DNA is lost, or deleted. 4. Frameshift: Since protein-coding DNA is divided into codons three bases long, insertions and deletions can alter a gene so that its message is no longer correctly parsed. There are other types of mutations as well, but this short list should give you an idea of the possibilities.